Cinematic misfires can happen in Hollywood. Cleopatra is a great example. Take A-list stars, add an exorbitant budget and you’ll have an instant hit, right? I appreciate Cleopatra (1963), but I can agree there are big issues that some recasting and other changes could have maybe improved upon. I use this as the foundation for my dislike of Edward Dmytryk’s The Young Lions. Dmytryk’s has told this story previously, exploring war and anti-antisemitism, with the only distinction being source material from author Irwin Shaw. What Dmytryk presents us with is an overdone war story whose themes are telegraphed so pointedly as to slap you in the face with their impact, while simultaneously avoiding anything that could anger a censor. Add in a trio of woefully miscast actors and The Young Lions becomes a Hollywood bomb. 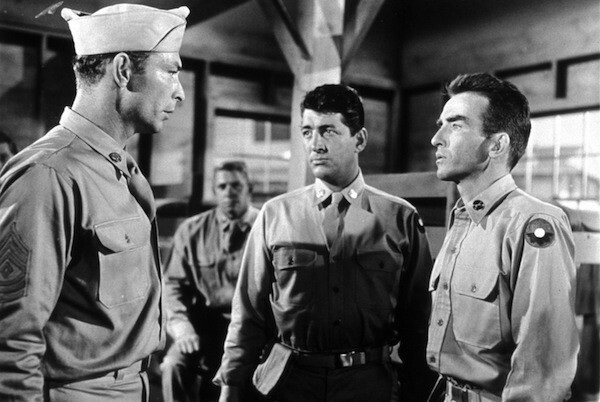 Three soldiers find their lives defined by the events of WWII: Christian (Marlon Brando) is a German soldier who cannot believe the Nazis are truly bad, Noah Ackerman (Montgomery Clift) is a Jewish American suffering from his fellow soldiers abuse and taunts against him, and Michael (Dean Martin) is a self-professed coward desperate to avoid fighting at any cost. It’s easier examining each story separately as, for the most part, everyone’s story is self-contained. I’m unsure how Shaw’s book is structured, but the movie presents each of the men’s stories in a way that never feels balanced. Maybe because his story was the most compelling, but it seemed like Ackerman’s story got the most screentime, with Christian second and Michael a distant third. Dmytryk has worked with triptych tales before, but I was wondering why Noah and Michael’s story wasn’t broken up into its own movie, it certainly could be. Instead, we’re left questioning whose story this is? If it’s the story of how their lives intersect, outside of one scene where they come together at the end, they’re separate. The way they come together provides catharsis, but more so as a capper against Nazism as opposed to any structural necessity. It’s hard even ascertaining their thematic connections short of being soldiers during WWII. So, let’s examine each storyline separately since that’s how they’re presented, from most enjoyed to least. Clift’s Noah Ackerman receives the most weight, probably because his arc treads similar territory as Dmytryk’s superior Crossfire (1947). According to IMDB, because of the Hays Code the film couldn’t directly attack Noah for being Jewish. Odd, considering Crossfire had to change that film’s source material of homosexuality to antisemitism. Not sure why they had to tiptoe around it now. (I’m open to comments about why this is.) Noah’s straightforward plotline hews as close to The Best Years of Our Lives (1946), and by that I mean that it blends the war with domesticity. Noah meets a sweet girl named Hope (Hope Lange) and after five minutes he’s in love and they’re married. Noah’s struggles with his unit involve him being beaten, desertion, and redemption. His arc is so cut and dry as to be stale bread, but it works. The problem lies in the nuances of Noah’s narrative. This marked Clift’s return about a debilitating car crash that nearly cost him his life. Much has been written about the changes to Clift’s gorgeous face post-crash, as well as his descent into drugs and alcohol. Though all the men are miscast, Clift, through no fault of his own, has no business being in this film. Already stepped in drug abuse, he looks far too unhealthy. If he’s considered 1-A, I’d hate to see who didn’t make it into this man’s army! Furthermore, Clift looks dazed, and I’m not talking drug-induced. His moments with Lange are okay, but when he has moments of emotion, like saying “I love you,” I’m not sure if he’s befuddled or if that’s how his face looks. What’s saddest is Clift was a man able to make a woman like Liz Taylor go weak in the knees. He’d be lucky to get Marjorie Main by this point. And there’s a rather tactless joke about Noah not being into girls that left me rolling my eyes. Michael’s story, overall, is one big moment of “meh,” probably because it feels like Martin receives the least amount of screentime. Martin used this as a testing ground for his transition to dramatic work, and I have no problem with him here mostly because he’s so negligible to events. His moments with Barbara Rush are great. Speaking of Rush, the women are all amazing! Rush’s Margaret first meets Christian during a skiing vacation in a sequence that left me wondering if they just couldn’t afford another woman and cast Rush by default, since there’s never ANY mention of it after. Hope Lange is sufficiently sweet, but her lines reiterate Clift is an “attractive, young man.” May Britt, as the Nazi commander’s wife, is also eerily frightening as a tow-headed opportunist. That leaves us with Brando as the Nazi, Christian. Before I get to him, let’s talk about Maximilian Schell’s debut in this as Captain Hardenburg. Schell was absolutely brilliant in Judgement at Nuremberg (1961), and while he was defending Nazis in that film he takes the reins as one of their captains here. His storyline, culminating with an accident that ruins his beautiful face – think that bothered Clift? – is far more heartbreaking than anything the trio of stars endure. And the fact he learned all his lines phonetically, unable to speak English, just proves Brando has no business doing a German accent. To go on a tangent about Judgement at Nuremberg. That film benefited from being made post-Hays Code. It’s unflinching examination of Nazism does what The Young Lions can’t. There, the German people’s ignorance was never outright stupidity, and the film took the time to explore the differences regarding apathy, willful ignorance, and the like, leaving it to the audience as to whether you believed them. It also never failed to compromise on the truth, that whether or not you were ignorant, the Nazis were a reprehensible group. That brings us back to Brando’s Christian. 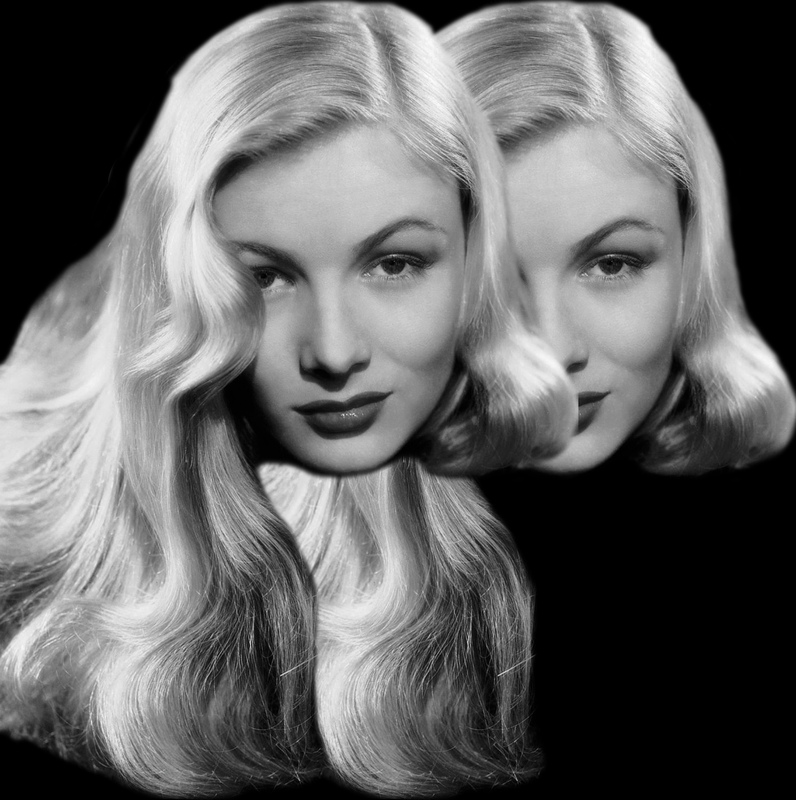 To get the small stuff out of the way: No one should ever give Rita Hayworth guff for her hair in The Lady From Shanghai (1947). Not if they’ve seen Brando’s bleached-blonde Aryan hair. Secondly, his accent sounds like the Swedish Chef and Don Corleone had a baby. (He’s far from Brad Pitt in Seven Years in Tibet.) He does open the film with a joke about Americans speaking with German accents as a clever icebreaker. As for his character, the script vacillates and gives Christian too many easy outs, avoiding demonizing Brando more than the character. Christian repeats his belief that the Nazis are comprised of a few “fanatics,” and that, overall, they’re going to restore hope to Germany. That’s all well and good before the war (although I call shenanigans), but once he’s knee-deep in the war the film actively shies away from showing moments of command. They actually remove Christian to Africa, as a means of having to explain how his beliefs remain unchanged. Christian does end up hearing about the concentration camps, listening in to a commandant’s horrific phone call about not being able to execute everyone. But Brando doesn’t bother to convey the horror of what’s being revealed. For someone just now discovering that concentration camps exist – we’re led to assume since we’re given no information to the contrary – he takes it rather well. And that’s as horrible as things get! There’s no judgement on his character, because there’s nothing for the character to be judged on. For all the attempts to mitigate how he’s not a bad Nazi, all we have is that he’s an ambivalent Nazi with some principles that are never put into practice. 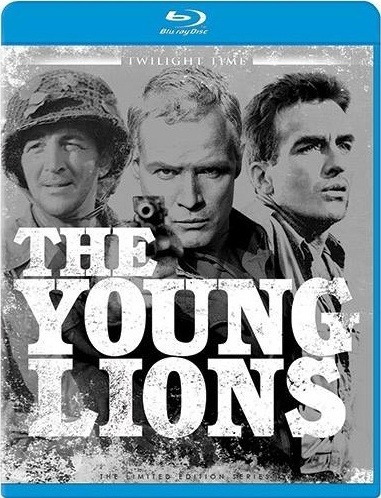 The Young Lions was meant to be a small production, but delays and other problems ballooned the budget. I have to wonder if maybe a smaller-scale production could have helped out the story problems (and would have forced more accurate actors). The movie isn’t heinous, but it’s a light portrayal of the war in the midst of superior war films, especially ones that would attack the Nazis head-on for their ignorance.